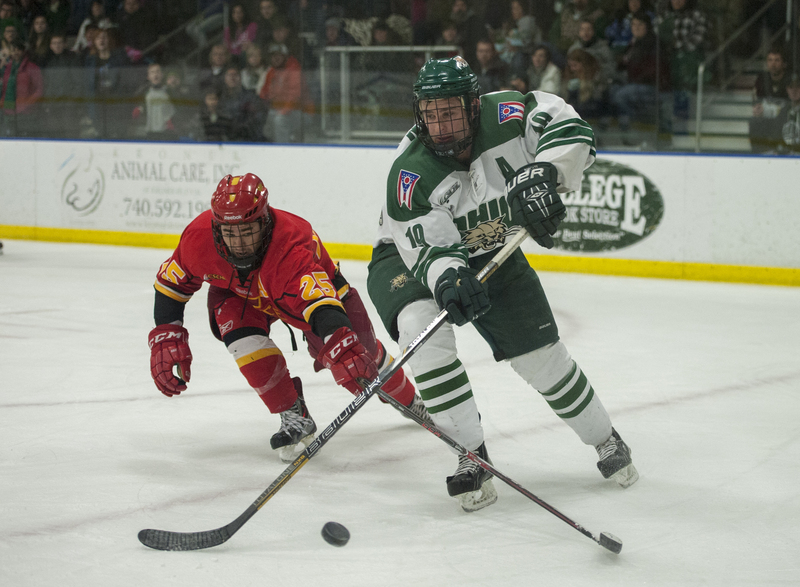 The Ohio Bobcats hockey team (22-6-2) finished off Alumni Weekend with an exciting finish that yielded a 2-1 loss in overtime to the Iowa State Cyclones. Tough play highlighted the first period, with multiple players limping off the ice after blocking heavy slap shots and taking devastating hits. The biggest scoring chance came exactly midway through the period off a turnover from J.C. Gulch for a 3-on-1, but a simple stick lift held off a shot and kept the game scoreless. Overall in the first period, the Bobcats held Iowa State to four shots and the penalty kill managed to hold them to no shots on two powerplays, including one blocked off. Following the first period, three former players from the heyday of Bobcats hockey were inducted into the Bobcats Hockey Hall of Fame. A long ceremony eventually gave way to a second period that seemed to drag on. After a few great chances from the Bobcats with passes flying through the crease, Iowa State got their own chance. A turnover along the side boards of the Bobcats zone gave Trevor Lloyd the puck for a quick pass to J.P. Kascsak for a carry into the middle and a wrist shot that went five-hole for the first goal of the game. The Bobcats legs died for a time after that, with two teams struggling to control the puck around the net. Nearing the end of the period, Patrick Spellacy became extremely aggressive, but eventually was penalized for a cross-check into one player knocking him into the player carrying the puck. That penalty would carry over to the third period. Penalty killing remained on a high in this game, killing off the Spellacy penalty and holding Iowa State to the outside for weak scoring chances. Just over the midway point of the period, Matt Hartman won a faceoff back to Tyler Benson on the left side. He passed it off the boards to Patrick Spellacy along the goal line for a snipe that somehow found it’s way through over the blocker on a nearly impossible angle shot to tie the game. With just ten seconds remaining, Chase Rey took a penalty for Iowa State for boarding on Gulch after the two had been at each others throats all period. The Bobcats entered overtime with a powerplay, but it wouldn’t last long due to a slashing penalty on Spellacy. These penalties yielded some of the most exciting play in hockey in three-on-three play. Less than a minute after the penalty was taken Gulch made a play in front of the net as the only defender for the Bobcats and gave Agnew and Hartman a breakaway. Nearing the net, the puck slipped off Agnew’s stick and fluttered to the side. Iowa State would retrieve the puck and give a breakout pass to Mark Huber coming off the bench for a breakaway. Exactly one minute after the Spellacy penalty, Huber deked backhand to forehand and put the puck five-hole for the game winning goal. The Bobcats ultimately led in shots 41-20 but were unable to capitalize on their great opportunities and split the weekend series. They will be in action again next weekend at Bird Arena against Illinois.